Highlight of the day: Meeting Bill Bryson, author of A Walk In The Woods. It was at a book signing for his latest work, The Life and Times of The Thunderbolt Kid at Whitcouls in Auckland. Nice fella, seemed interested in my upcoming PCT attempt. If I were to write a book about what ever happens this summer, I’d have to call it A Walk In The Hills. This all made me think about what has brought me to the PCT. In 2003 I was planning my O.E.. I grew up in England and as a local I hadn’t bothered to travel all that much, so I hit upon the idea of seeing the countryside along The South Downs Way. But that seemed weird because I’d day 4 days to walk what I’d normally drive (or be driven since I was too young back then) in half an hour. But I liked the idea of walking so I looked for something in Europe and discovered The Tour du Mont Blanc and a photo from Jørgen showed me the wonders of Jotunhiemen. I completed them and it felt pretty good. Then A certain Mr Terry Long suggested the Appalachian Trail. It was list of legendary mountains I’d heard of since I was a kid. The Smokey Mountains, Blue Mountains, Shenandoah N.P. and it sounded great, but 6 months!! no way. Well maybe, before I’m 30 that was a few years away then I could postpone it. I got back to NZ after my in Europe and had kept the idea of the AT in the back of my head. 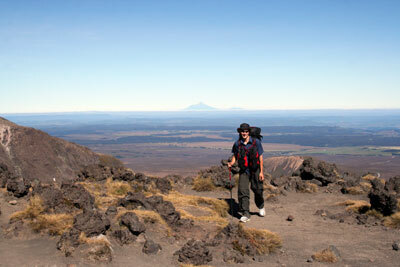 In March 2006 my dad met a hut warden in Tongariro park. Going by the name of Gloves she had walked from Mexico to Canada along The Pacific Crest trail and loved it. A border to border walk made so much more sense to me. people don’t know where Georgia and Maine are, but Mexico and Canada are pretty obvious, and it was only 500 miles longer than the AT. And that was that, for the last year I have been slowly gathering momentum and now I am just 8 weeks away from putting my toe into Mexico and facing north. Another training weekend under the belt, and another mountain summit reached. For the third year in a row I took park in The Great Lake Relay, which circumnavigates Lake Taupo taking in 154km of scenic New Zealand. This year I had the first (at 2am!) and 14th legs. With a little sprint I was even leading the pack coming out of the first road and our of Taupo, but once we hit the first hill (about 400m from the start) I was being overtaken and was probably somewhere around the middle when I finished. I was then in the support car until just after sunrise and back to the house for a nap before getting to my next start point. We had a dozen or so runners and together we made it in 14hrs 15 which is much faster than last year. That night I attended a talk about the Oxfam Trail Walker Challenge which Rachael and Tania are taking part in. It’s 100km in 36 hours and I’d love to take part but it’s after I fly out of here, speaking of which I need to get my tickets sorted. On Sunday the three of us did the Tongariro Crossing and we did it pretty fast with the stair case taking only 30 minutes. I took an hour long side trip to the peak of Tongariro while the girls happened upon a wedding going on at the top of Red Crater. The bride was even in a proper dress, but she was wearing sensible hiking boots While Rachael and Tania went light weight, carrying only what they’d need for their charity event, I loaded up an Aarn Natural Balance which they lent to me for the weekend. It was as full as I could get it and weighed close to 20kgs, but true to their word it didn’t hang from my shoulders. The clever rigging puts the weight on the belt and with front packs taking full water bottles I was standing up straight the whole way, no back pain. Physics being physics I still had to carry the extra weight though and it certainly wasn’t easy keeping up with two trail runners on the long down hill after the Ketetahi hut. We reached the road end in just 6:40, a respectable time in anyones books. 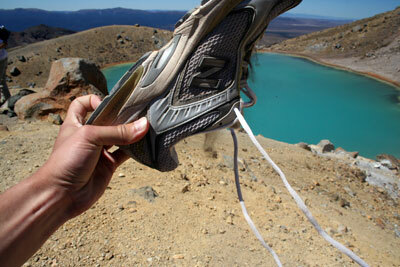 I was also wearing brand new New Balance 1222s I’d bought the day before. They sure let the dust in as I ran down the Red Crater gravel slope, hopefully that means they’ll let the water out just as easily. The arch of my right foot got a little sore, but some strapping tape stopped it getting and worse and I didn’t get any blisters. The GPS logging unit didn’t quite do as well. It logged the whole way, at least I think it did. But when I got it back to a computer the files were really messed up, unreadable on my Mac. I think I turned it off while it was writing, that can cause trouble. So I walked to work with it today, no problems. Now that it is fully changed I am leaving it on until it goes flat, to see just how long it will go without the solar panels. With the completion of the Round The Mountain (Ruapehu that is) last weekend I have done all the Central Plateau hikes this year, and this weekend I’ll doing the crossing again just for fun, and to try out a pack from Aarn. On this trip I used Paul’s MacPac Ascent Classic. With the size 3 harness it is 70L+ and I was glad for it. My sleeping bag is bulky and clothes for 4 days are similar in size to clothes for 9 days. This was my first time with a CamelBak and I really liked it, I kept two water bottles in the outside pockets like I usually do, but only drank from the hose, with it being so easy I found I got through a lot more water which is probably good for me, so I’ll have to get one of those in San Diego. The Round The Mountain track is by far the longest and least trodden of the tracks. It starts in Whakapapa and heads across the Tama Saddle to Waihohonu which is the reverse of the last leg of the Northern Circuit. I had taken a long time to get going that morning so I powered up to the saddle, scoffed lunch and set off for the hut, where I promptly found that the tag the DOC lady at Whakapapa sold me wasn’t valid for camping at this hut. I really have my doubts about the DOC staff there. Last time they sold me camping tickets for huts that didn’t have campsites, and this time they sold me a back country hut pass when I needed a Great Walks Hut pass. Grrrrr. The very particular hut warden took my credit card number and will now charge me an extra $15 for that night. Anyway, I got a prime tent spot, being the only tent there, under the trees to avoid the dew and talked to a guy from Scotland about him trying to convince his girlfriend to move to Canada. Back to my tent and I found the only other person not staying in the hut had decided to set up about 10m from my spot. In the whole camp ground, were every other spot was clear, he preferred to make an entirely new place in the middle of the big flat communal area (instead of one of the areas cleared marked out by trees and bushes) to face directly into my tent, geez, personal space man. Back to the hike. I set off quite early and took the time to see Onipango Springs, very nice and worthy of a swim, but not at that time in in morning. A long gentle rise on a dry sandy river back and then across some rocky plains to the dirt road before the Rangipo hut. This is a pretty desolate place, as my pictures will show when I upload them. Luckily for me some kind souls have put bridges in over most of the big rivers, and since this area is entirely rock it is really appreciated. Getting washed away here would be very bad. I crossed the Wangaheuhu River, where the lahar will flow when it finally bursts through the damn, the wire bridge there goes over the deepest part and feels really flimsy compared to the flow of the glacial melt below. By the time I reached Rangipo it was raining, I ate inside and carried on when the rain died away. Down in the valley the army were testing explosives though I thought for a time the rolling sound was thunder, or maybe even the lahar coming down. After Rangipo there was a really big gorge, a steep descent and then a climb up the other side was really hard, good thing the wind was blowing my way. Since leaving the river bed that morning I’d been in the true Mordor but now I was reaching the tree line again. One last copse of trees and I smelled wood smoke and sure enough the hut was right around the corner. Again I struggled to find a tent spot, but with my trusty orange trowel I dug out some roots and made room. The tent held up fine in the wind and rain and I was off early again. After only a couple of hours I was at the Blyth Hut turn off and retracing my steps of a few weeks before. back to Oakune Mountain Road, up the hill to Taranaki Corner, down the Cascades (much scarier going down that way) and lunch at Mangaturuturu. Then on towards Whakapapaiti. At some point earlier that day I had decided that if I reached Whakapapaiti by 5 I would carry on and walk out that day. I rolling in at 4:30 and did indeed carry on. My feet were sore and I was thinking I’d gone too far but I was down at Whakapapa before 7pm and thus completed 31.9km that day. With the additional walk to the car I had made 20miles, and that is only the average for the PCT. The first few weeks are going to be good practice for the rest. You are currently browsing the PCT2007 weblog archives for February, 2007.